Legacy Nursery Products was born out of commercial growers' needs for a better way to grow trees in containers. Traditional container tree production has numerous inherent problems, especially circling roots, splitting containers, tree blow-overs and high root zone temperatures. 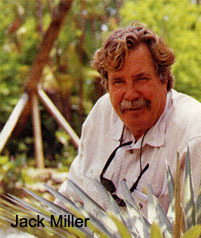 In the late 1980s, Legacy Nursery Products' owner Jack Miller became especially aware of the problem of circling roots in container-grown plants when he was a member of the committee to revise Florida Grades and Standards for Nursery Plants. One of the committee's goals was to focus on the issue of spiraling roots in container-produced trees. The severity of this root-circling problem was dramatically demonstrated during Florida's Hurricane Andrew in August 1992. Many of the trees blown over in the hurricane showed evidence of never having outgrown the root-circling pattern they established when grown in conventional plastic nursery containers. Because of this, the trees were never able to properly anchor themselves when planted. Hurricane Andrew showed how serious this root-circling problem could be, and Miller realized the importance of finding a container production method that was practical and cost-effective, and provided air-root pruning to prevent spiraling roots. 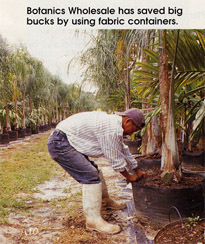 Miller, who is also owner of Botanics Wholesale, Inc., a wholesale plant grower in Homestead, Florida, and his Vice President Chris Oppenheimer, had been utilizing air-pruning containers in their liner production since the mid-1980s. However, they found the air-pruning container methods commercially available at the time to be impractical for large-scale nurseries due to their cost and cumbersome nature. 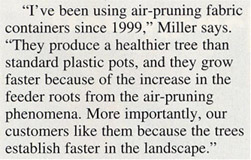 Miller began searching for an better way to grow air-root-pruned trees in large-scale nursery production. What he found was a sturdy fabric called non-woven polypropylene. This product, commonly used in civil engineering projects, has tremendous burst strength and porosity, and allows air flow over its entire surface. Miller realized this would provide the air-pruning he wanted, while also moderating soil temperatures for cooler root zones. With the help of textile engineers, Miller tested many generations of this new fabric container in the field. The result was JackPot, a fabric air-root-pruning container that is rigid and easy to use. Miller also incorporated a high UV protection requirement, which offers an excellent service life of three to five or more years (depending on fabric weight), even in the extremes of Florida sun. The container was named JackPot to demonstrate the pay-off growers receive when using this product to overcome the risks of the agricultural business. Once JackPot was ready for use, an efficient method for mixing soil and filling the containers was needed. Miller discovered that the Kuhn Knight Reel Auggie, designed to mix cattle feed, was also ideal for mixing soil. The Reel Auggie mixes the soil and shoots it out a side shoot, where the JackPot is filled. Available in stationary, truck-mounted, or trailer-type models, this machine is versatile for field use. With this excellent new air-root-pruning product and efficient mechanization for filling, an affordable and efficient method for growing healthy plants was realized. The JackPot costs less than all other containers on the market, provides air-root pruning and moderated root zone temperatures, is extremely sturdy and durable, allows for root tack-down and prevents wind blow-overs, and greatly reduces the amount of storage space needed for containers. In the early days of JackPot use, customers who purchased trees grown in the JackPot quickly began to realize the advantages of the container, and began purchasing it as well. One customer purchased 75,000 containers for exclusive use in a new 150-acre container tree nursery. Trees grown in the now-patented JackPot are truly "legacy trees," trees that will thrive for the full length of their natural life. The company Legacy Nursery Products is named for these legacy trees, and is proud to offer Progressive Products for Progressive Growers. Excerpts and photos on this page are from the article "The Art of Selection" in the June 2004 issue of Ornamental Outlook. Photos and article by Roy C. Padrick. See the full article.